This handbook gives you everything you need to now in order to travel out and experience the world outside Europe . 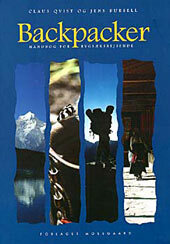 Contains chapters on planning, tickets, passport, visa, vaccinations, ensurances, money and creditcards, guidebooks, equipment and packing, transport, bordercrossings, communication, photography, firstaid, camping, hostels - plus special inspirationchaptors on different parts of the world. Forlaget Mosegaard 2000, 176 colorpages in danish.